LLOPS » What has your state bar association done for you lately? What has your state bar association done for you lately? What has your state bar association done for you lately? Quite a bit, actually! (Unless you’re in California, Delaware or Montana). For attorneys in the other lucky 47 states, state bar associations provide access to Casemaker or Fastcase or InCite! 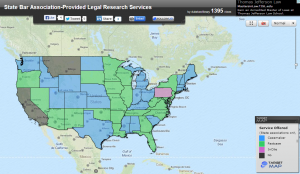 If you’re curious to see which service different state bar associations provide, check out this fantastic map created by J. Michael Goodson Law Library at Duke University School of Law! A screenshot of the State Bar Association – Provided Legal Research Services map. Thank you Goodson Law Library! Here in Washington, the WSBA provides access to Casemaker. Casemaker provides access to case law, statutes, and other materials from all 50 states as well as a large federal data set that includes Supreme Court Opinions, Circuit and District Court Opinions. More information can be found on the WSBA Casemaker page!